Elizabeth started singing and playing Music Theatre at the age of 9; including early roles in high school musical Southern Lights an Australian musical, Godspell, Anita in West Side Story, and Sally Bowles in Cabaret. Professionally, from age 17, Elizabeth worked in the Cabaret /Theatre Restaurant scene in Sydney as the leading lady in 5 consecutive 7 month productions, which also toured the East coast of Australia and won her top industry awards. These roles included Maid Marion in Robin Hood, and Guinevere in Lancelot. Whilst completing her diploma in Acting from the Actors College of Theatre and TV in 1994, in Sydney, Elizabeth also worked as a professional session singer, both in the studio and doing gigs around town in small a cappella groups. Repertoire included music from African, Gospel, Funk, Jazz and World Music traditions. In 1995, Elizabeth toured the black churches in the Southern States of America (New Orleans; Memphis and Birmingham) to get a feel for Gospel music first hand, and has sung both as a soloist and in the choir with some of Americas great gospel choirs. In 1998, Elizabeth decided to leave her musical comedy and pop music roots (and her country) to further develop her voice by studying opera and classical voice in Europe. In 2004, after Elizabeth had completed a section of her classical and operatic studies in London (5 years) (with David Harper and the English National Opera (ENO), she moved to Paris, with her French husband Albert, and was offered the job of relaunching and directing the Music Theatre Programme at V.L.A.N an association in Noisiel, a suburb of Paris. Elizabeth relaunced the programme in September 2004, and directed the school's first hit show, "Grease", followed by a show in 2006 inspired by "A Chorus Line", "What I Did for Love", which she wrote for the group, and encompasses a variety of different Broadway styles. 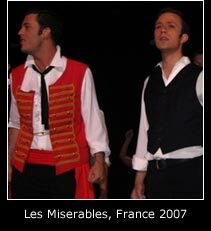 In 2007, Elizabeth directed "Les Miserables" (in French), where the cast was joined by a 70 piece choir and Conservatorium orchestra for the production. 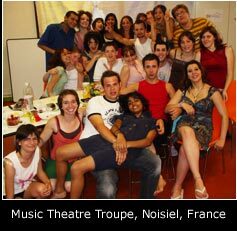 From 8 students in 2004, the group were over 100 in Les Miserables. 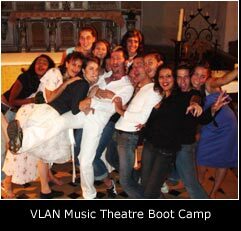 During this time in Paris, Elizabeth also ran a private studio coaching singers, and a Music Theatre Summer Camp in the Vercors, through the association l'ARS, in the picturesque hills in South of France. (One Woman shows Paris and New York City) /Broadway teacher (CCM, USA). Limited to 10 singers only!! Prepare minimum 2 contrasting songs, bring 2 copies of music. Elizabeth is a certified CCM (Contemporary Commnerical Music) Vocal Teacher of the highest level, *certificates I, II and III), graduating from Shenandoah University's Vocal Pedagogy Institute, USA in 2010. Prior to this, as a professional singer, Elizabeth trained and used this method and tools in her singing in London and New York. As a young Director in Paris, Elizabeth also found this work invaluable, in fine tuning her cast, both individually and as a group. What is CCM and Somatic Voicework? 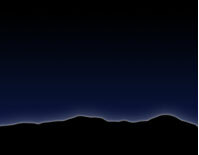 Somatic Voicework™ The LoVetri Method is a body-based method of vocal training which draws from many disciplines. It is based upon voice science and medicine as well as traditional classical vocal training, complementary modalities such as yoga, movement, dance, acting, and speech training, and various bodywork approaches. Somatic Voicework™ The LoVetri Method is meant to unselfconsciously draw the mind of the singer into the physical process of making sound. Research undertaken by Jeannette LoVetri and Edrie Means Weekly of Shenandoah Conservatory, which was published in the noted scientific Journal of Voice (Vol 12, No 2, 2003), has shown that 34% of university teachers of non-classical music, particularly music theater, have neither training nor professional experience in music theater yet are still teaching it. (This music, in all styles, is now called generically, Contemporary Commercial Music or CCM). Music theater now utilizes all styles including, rock, pop, country, jazz, gospel and folk, yet until recently there have been no formal university level programs in any of these styles with the exception of jazz. Young singers who wish to sing in these styles are forced to choose classical vocal training, acting training, or no vocal training at all, if they wish to attend college. There has been a very large gap between college training and real-world practicalities for a singer of CCM. Since 2003, the Shenandoah Conservatory and Jeannette LoVetri have offered a summer intensive of Contemporary Commercial Music Vocal Pedagogy based upon Somatic Voicework™.